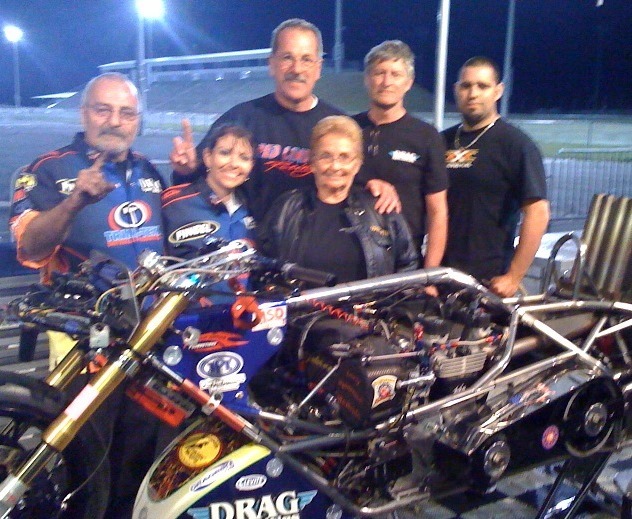 On Friday, November 8th, 2013, at a drag strip located in Bradenton, Florida in the USA, a clash of Top Fuel motorcycle teams will occur. The two quickest Top Fuel motorcycles on planet earth will meet for the first time since 1998. There’s a lot more at stake here than an event victory, but to comprehend this you have to understand the contestants. 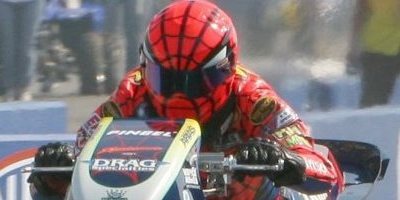 First there’s current reigning king of Top Fuel motorcycle racing, Larry “Spiderman” McBride, from Virginia, born and raised right here in the USA. Larry pilots the first Top Fuel bike ever to break into the sub-six-second elapsed time zone. He’s also the first Top Fuel bike pilot to enter into the prestigious MTC 5 Second club which has only eight slots. Larry has won many Top Fuel championships here in the USA and has covered the quarter miles drag strip as quick as 5.79 seconds. 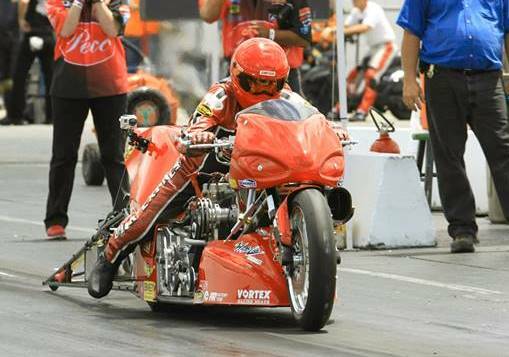 Up until September 24th, 2012, Larry was the quickest drag bike on planet earth. Now the contender; enter Team STARTA from the country of Sweden. Larry HAD the quickest drag bike in the world, but no more. The Svensson brothers, Peter and Soren from Sweden are now owners of the quickest drag bike on planet earth. Their 5.70 pass at Tierp Arena, in Sweden, in the year 2012, earned them that bragging right and rightfully so. It’s interesting to note that on that pass, Peter Svensson was in the right lane, was drifting right, and was forced to shut off early. At 1000’ he was traveling at 238mph, and slowed to 220mph at the finish line. There’s a lot more in that bike to uncork and Team STARTA is just the team to do it. Larry’s contenders are not pretenders. When these Top Fuel motorcycle drag racing Titans clash at Bradenton, there is far more than a drag race at stake. The Battle of Bradenton is for the Top Fuel motorcycle supremacy of the world. A title Larry’s mentor Elmer Trett held in his iron fist more often than not from 1979 till his death at Indy on September 1st, 1996. The real battle in Bradenton is not just about a drag race, this is an assault on a king in his homeland. American writer Ralph Waldo Emerson is said to have once written, “If you strike at a king, you must kill him.” Metaphorically, this is why the Svensson’s have come to America, to claim their place on the throne as he new kings of Top Fuel bike. But to do so they must first slay the king in his homeland, IF they can. There are many pros and cons to this match up. Team STARTA clearly has a quicker motorcycle that has yet to make a full pass at it’s full potential. They have been racing in the class of Top Fuel since 1993. Larry McBride had thirteen years of racing Top Fuel bikes under his belt when the Svensson’s made their first pass in the class. Larry McBride and his brother Stevie McBride are racer/crew-chief, just as the Svensson brothers are. 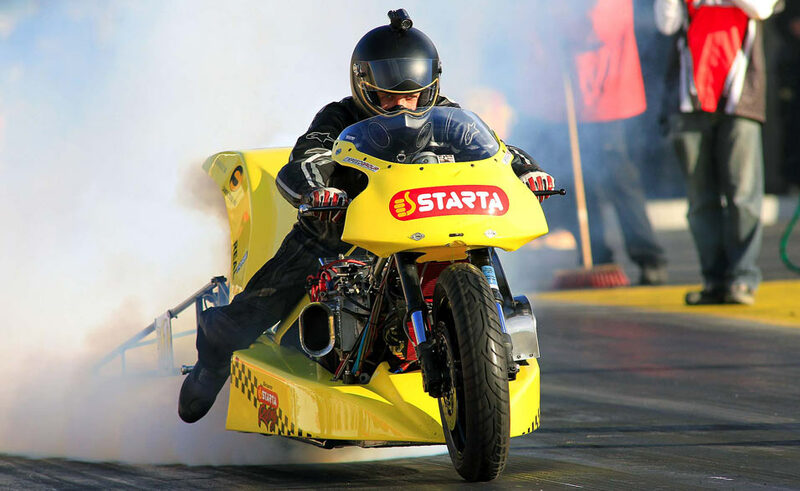 Larry has been racing in Top Fuel bike since 1980, and in drag racing there is no substitute for experience, not in the hot seat, not in tuning the motorcycle; thirty-three years of experience comes to the starting line with Team McBride. And these two racers are not alone in the Battle of Bradenton. For them to meet in battle they will first have to contend with all other entries in the class, some of whom are capable of beating them both! Top of the list is Chris Hand, pilot of the Red Neck Express Top Fuel bike. 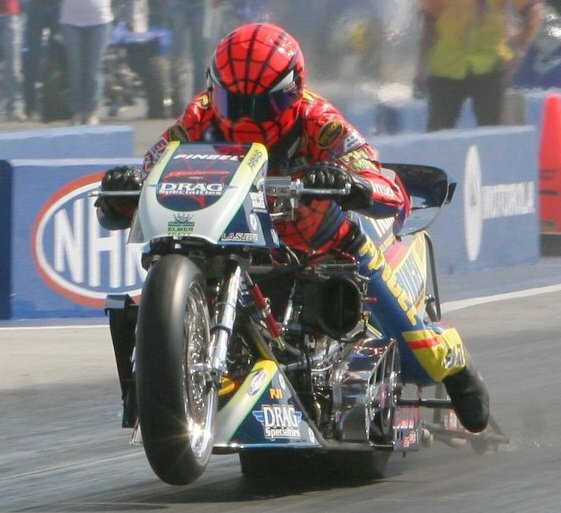 Chris ran a 5.89 at 230mph in August of 2013, and his run was also a shut off pass at 1000.’ There’s no question Chris as a 5.70 hiding in the bike right now, if his tuning combination is right there’s no telling just how quick he can be. During the Bradenton race, Chris will be formally inducted into the exclusive MTC 5 Second club for his accomplishments earlier this season. The potential in the Red Neck Express drag bike is not to be over looked and the same must be said for the next three contestants. Sam Wills, who is currently driving a Top Fuel bike in conjunction with Mike Dryden is a solid contender. While the bike is less than a year old, Sam has been piloting fuel drag bikes since the early 1970’s. Sam’s handy work had a ton to do with the Terminal Van Lines bike performance, he played a vital roll in most all of Carl Ahlfeldt’s Top Fuel motorcycles. I expect to see Sam run in the 5’s at Bradenton. How deep into the fives is anyone’s guess. Dave Vantine is new to the class of Top Fuel bike but he’s a valid contender to be in this race. The bike he pilots is the motorcycle Geoff Pollard piloted to a 5.93 elapsed time clocking that put Geoff into the MTC 5 Second club in 2009. The machine has nitro-cookies, but can he and his team bake em right? The potential is there, starting on November 8th we’ll all find out what he and his team can do with their combination. At the Battle of Bradenton, all three of the previously mentioned riders have a shot at the exclusive MTC 5 second club at this race, as does of course Peter Svensson. ANY of the aforementioned racers can win this race, but only two slots are open in the MTC 5 Second club. The standards set forth by MTC will determine who is eligible. In as much as the sanction AMA PROSTAR is no longer in existence, the current owner of MTC, Mr., Eric Hochstetler, graciously has decided carry on the 5 Second Club by adopting the Manufacturers’ Cup series in place of the now defunct PROSTAR sanction. “We are proud to induct Chris Hand into the club at the Bradenton race and we’ll be watching with interest for any racer who runs a five second elapsed time during qualifying or eliminations at all Manufacturers’ Cup races” stated Eric in a recent interview. MTC Engineering will pay out a total of $4,500 in money to eight 5-second club members. Chris will receive $500 as the sixth member of the club and that leaves 2 open spots remaining to fill the elite club of 8 racers. The current members are: Larry McBride, Jimmy Brantley, Tom Perry, Korry Hogan, Geoff Pollard, and Chris Hand. In this clash of Top Fuel titans at the Battle of Bradenton who will come out on top? Will the King of Top Fuel retain his crown? Will the Dark Horse vault from the darkness and surprise all the previously mentioned contenders (this is drag racing, anything can happen)? You have come to the right place my friend. Cany believe the biggest Top Fuel Bike showdown for many years is on and there is no audio or video online.